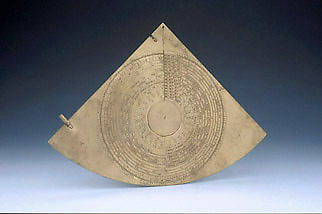 Epact: Quadrant unsigned, late 15th century ? This quadrant is both an observational and an astrological instrument. On one side is a sinical quadrant and on the other a volvelle. When the date is given, the brass arm of the volvelle allows various celestial times and periods to be determined, based on such movements of the planets and the moon as trepidation, medium motum and medium argumentum. The correct values of all these intervals were very important for astrological predictions.